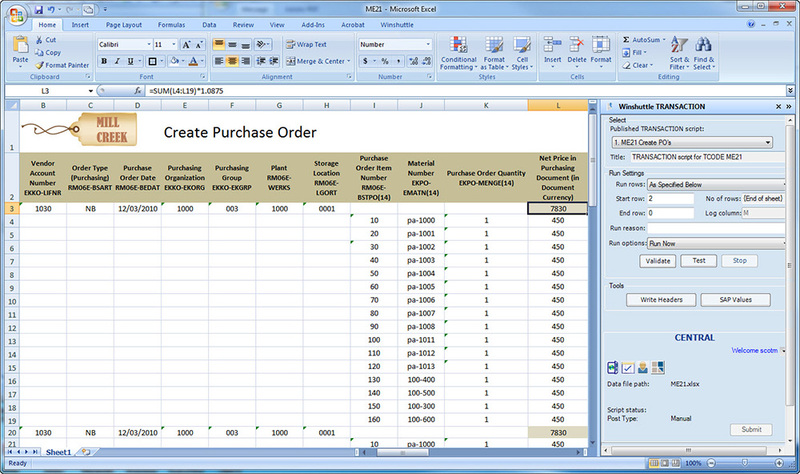 Winshuttle technologies enable users to create purchase orders (POs) in SAP using standard Excel-based templates. These templates help companies save time and money by helping users avoid the many repetitive actions that can be part of creating a PO in SAP. Companies can use Winshuttle technologies to improve the SAP purchasing process via workflow. For example a business organization can use Winshuttle technologies and SharePoint to model the approval process without programming. 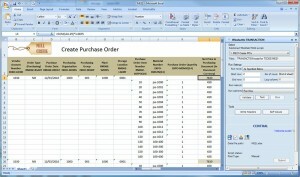 Do I have to use the transaction ME21 to create a sales order? No. Winshuttle Transaction works with any standard SAP transaction code including ME21, ME21N and customers’ own Z transactions. How can I be sure that my purchase orders were created correctly? Transaction provides pre-posting validation. Transaction and Winshuttle Server provide the responses from the SAP at the item level to the data source. Update successes and failures are visible in real time in the data source and in SAP. How is the vendor creation and maintenance process modeled? Business users record transactions following their approved process and then map the data to Excel or other online forms. Winshuttle Central uses SharePoint workflow for process modeling. Does this solution require configuration changes to my SAP system? No. Transaction requires no ABAP components and does not require any changes in SAP system configuration. Can an unauthorized user create purchase orders using this solution? No. Transaction requires all users to have SAP credentials and they can only execute or record Transaction scripts against the transactions that they are authorized to use in SAP. Make Winshuttle your data management solution. © 2019 Winshuttle, LLC. All rights reserved.